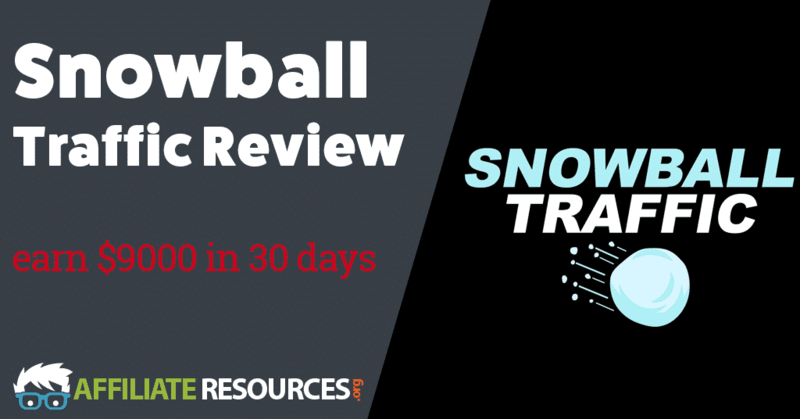 Snowball Traffic Review - A Snowball's Chance in Hell for Profit? Snowball Traffic is a course created by Fergal Downes, Bill Hugall and Simple Spencer. It promises to be able to deliver you results without having to build a list, create a website or possessing any tech skills. It also claims to be very newbie friendly. According to the sales page, your traffic and profit gets bigger and bigger like a snowball rolling down a mountain. With all the claims that Snowball Traffic promises, it’s easy to see why it would be so enticing. When you first land on the sales page for this course, you’re greeted by the promise of some pretty impressive results and promised that this method can be completed by anyone, regardless of their skill level. Scrolling on down the page, you’ll find a countdown timer right above the buy button. Normally, this isn’t something that I paid too much attention to. With this sales page, one thing really seemed to stick out and that was the fact that it seems like no matter when I visited the page, it always said it was a discount price that would end in seven minutes and 25 seconds. Keep in mind that I visited the sales page several times over the course of a few days. Regardless of the timer, after clicking the buy button you’re taken into a normal sales funnel for this kind of product. Most courses and products like this one offer between two and three upsells before finally taking you to the product that you purchase to begin with. Snowball Traffic has five upsells and five downsells. I skipped out on all of them, but here’s a quick list of the upsells offered inside of the sales funnel. Upsell #1: “Fergal’s Proven Done-For-You Templates and Case Studies” – This upsell promises to give you a “done for you” package that will help you “get way ahead of the pack.” At this point in time, you still don’t know exactly what the traffic source is for Snowball Traffic, but according to the sales page for this upsell, only 30 spots are available and it will “ensure you get insane results with the Snowball Traffic system.” When you decline this offer for $27, you’re taken to a down sell that offers the same material for $17. Upsell #2: “Additional $200-$300 Per Day Method” – This upsell promises to teach you another method to earn an additional $200-$300 per day for $17. When I saw the sales page, I have to say that I was very leery since I still didn’t know exactly what Snowball Traffic was even going to be about. Second, the sales page also promises to help you get “way ahead of the pack,” and just like last upsell, is limited to only 30 people. When you decline this offer for $17, you’re taken to a down sell page that offers the same product for only $12.  Upsell #3: Full Resell Rights to Snowball Traffic – This upsell gives you the ability to use and resell the entire Snowball Traffic sales funnel. It’s available for $37 and according to the sales page, only 30 slots are available. Declining this upsell for $37 will take you to a down sell page that offers the same product for $27. Upsell #4: How to Bank Five Figure Paydays – This upsell promises to give you a course that will teach you how to make five figures per day for $27. Just like the other upsells inside of the Snowball Traffic sales funnel, it has limited spots available with this one claiming to only have 40 open slots. Just like with the other “methods” in the Snowball Traffic sales funnel, this one gives no clarity as to what exactly you be doing to bank these five figure paydays. Just like with the other upsells, when you refuse to purchase this one, you’re taken to a down sell page that offers you $10 off the price tag of $27 making this upsell $17. Upsell #5: How to Build A Highly Profitable Buyers List – The final upsell inside of the Snowball Traffic sales funnel is a course that promises to teach you how to build a buyers list quickly. Just like all the other upsells, it claims to have limited availability of only 50 spots. The price to get in on the buyers list training is $12 but just like the other upsells in the funnel, declining the upsell will take you to a down sell page which offers $5 off the price making the final price you’d pay $7. After declining the 10th total page inside of this sales funnel, you’re finally able to access your purchase of Snowball Traffic. While the method behind Snowball Traffic is one that I’ve seen several other people discussing for quite a while, the course does give a unique take on it that could really help to accelerate your results. 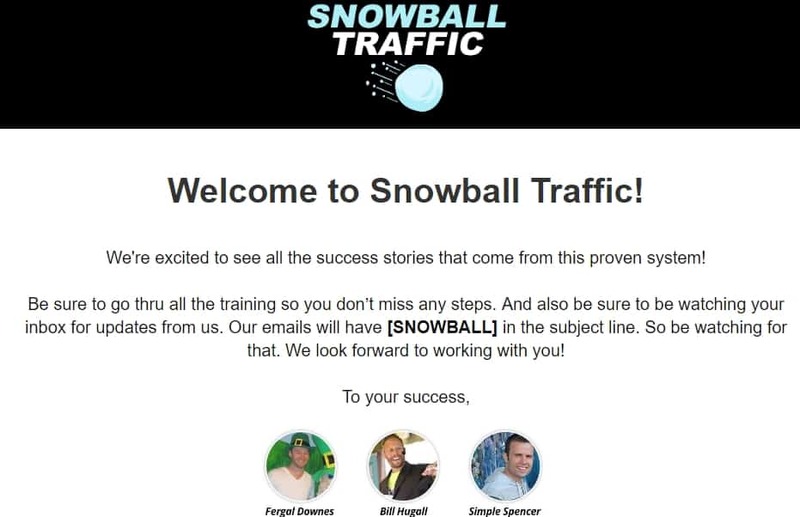 The method revealed inside of Snowball Traffic is simple and easy to use, but the training that Fergal and team have created really goes in depth and leaves no stone unturned for the process. The buying process of Snowball Traffic is very time consuming. By the time you refuse every offer thrown at you to get to the product you purchase, you’ve spent quite a bit of time just saying no. I’m not a fan of upsells on the best of days, but when every upsell offers you a discount for just saying no, you can’t help but feel a little sorry for the people who came through the sales funnel and took the product creators offers right off the bat and lost money. The course gives very detailed instructions on how to execute this method, but it is still just one single method that you don’t own. Should the company behind this traffic source suddenly decide that they no longer want to offer the service that is being used, you would find yourself at a total loss if you had only done this one method. While the sales pages for Snowball Traffic claims to have had significant success with this method, most of the method is one that has been talked about quite a bit in the past with many people saying that they felt as though they had wasted time and didn’t see very good results from their efforts. Once you get inside of the training for Snowball Traffic, you’ll find out that you must spend a little bit of extra money on ads to really start to build up your audience. While it’s a relatively low investment (around $20 – $30) it still worth mentioning that you do have to invest more money after purchasing the course to give it an honest go. Most online businesses require additional investments, but there normally in the form of tools and services rather than ads. The Snowball Traffic course does a great job of really going into detail about the traffic method it’s using. Since I have heard about this traffic method numerous times in the past, I don’t mind mentioning that what you’re basically doing is creating Facebook groups so that you can leverage members into purchasing recommended products through affiliate links. Using Facebook groups for traffic generation is nothing new, but Snowball Traffic does give a unique take on an additional step that I wouldn’t have thought of previously. Does this unique twist justify the price tag on this course? Perhaps, but most of what is covered in the course I’ve taught inside of Wealthy Affiliate. On top of that, while it could be possible to make significant profits with this method, there are a lot of online business owners out there who claim that social traffic is the hardest traffic to convert into paying customers. Yes, there are also many stories that claim that social traffic has built businesses overnight, but no matter how you look at it, it’s still going to always be something that you must constantly give attention to if you want to succeed with it. Many of the traffic methods that I use for my online business are ones that you can put in the work one time and see results for quite a while in the future. With the method you’ll learn about in Snowball Traffic, you could see results for a while, but you still must constantly be adding new posts to your group, finding new products to recommend and finding the time to be active inside of the group so that engagement stays as high as possible. While this method will work very well for some, just be aware that you will be spending a significant amount of time engaging with an audience that could be taken away from you in a moment’s notice. This combined with the fact that loyal customers are potentially penalized for purchasing upsells without saying no and receiving significant discounts makes this course one that should be passed on, in my opinion. So, What’s Better Than Snowball Traffic? If you’re wanting to build an online business that will pay you for years, take a moment to check out my top recommended resource. By following the training there, myself and many others have been able to build full-time online businesses that don’t rely on traffic sources that may disappear overnight. Have a look at the comparison between Wealthy Affiliate and Snowball Traffic.